All geared Head Lathe comprising of Hardened and Ground Bed, American A2-6 Spindle Nose, R.H. Hand Wheel Apron, Square Tool Post and Electrical Item suitable for 415V, 7.5HP, 50 Cycles with 5.5KW Motor. J. R. Rao & Co.
All geared Head Lathe comprising of Hardened and Ground Bed, American A2-6 Spindle Nose, R.H. Hand Wheel Apron, Square Tool Post and Electrical Item suitable for 415V,7.5HP, 50 Cycles with 5.5KW Motor. Backed by 27 years of industry experience, we are a Professional Trading and Servicing Organization in the field of Machines and Machine Tools & Accessories. 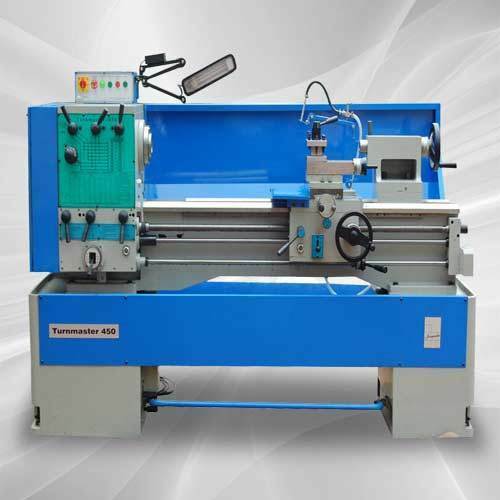 Our main products are CNC Lathes, Straight and Slant Bed, CNC Vertical Turret Lathes, Machining Centres Vertical & Horizontal, Drill Tap Centre, CNC Drilling, CNC Cylindrical & Surface Grinding, CNC Press, CNC Brake, CNC Shearing, Lathes, Milling, Drilling, Grinding, Power press, Press Brake, Shearing, All types of Metal Cutting and Metal Forming. The machinery supplied by us are used extensively by varied engineering, mining, automobile, infrastructure & manufacturing industries. Our machines are notable for their precise operational functionality and optimum efficiency in heavy-duty applications. We also provide user manual for providing machine related information to our clients. With the help of our professionals, we also undertake services related to reconditioning of machines. In addition, our capabilities in offering suitable installation & operational training and on site support, are acclaimed for effectiveness. We ensure that we procure the products from credible manufacturers and vendors for absolute assurance of quality. These products are tested by the manufacturers as well as by us at our premises on stringent parameters. We have competent Service Engineers to take up services for any of the above machines. We also take up Reconditioning of any Branded Machines. We give Spares & Accessories for all Branded Machines.